This is a continuation of the story of Cassia and the two men she loves. She is leaving behind Xander, perfect Xander who is destined for greatness within the Society, Xander, to whom she is Matched, and looking for Ky, the Aberation who has been sent to die in the Outer Provinces, the man who has stolen her heart. And Cassia does find Ky. It’s almost too easy, the way this soft and pampered girl jumps an airship, escapes from a doomed village, runs twenty-five miles into the bleak Carvings, and catches up to Ky, who just happened to escape from the same village two days before. The journey changes her. For now, along with finding Ky, she has a second goal of finding and joining the Rising. This really isn’t the Cassia I came to know in the first book. Unfortunately, Ky doesn’t feel the same way about the revolution. And Cassia doesn’t yet know that Xander has already joined. But Ms. Condie’s writing has a definite beauty, a thoughtfulness to it, that I did enjoy. The characters are unique from each other, though sometimes they say or do things that seem incongruent, and the wilderness setting feels beautiful and real. I’m especially intrigued by her theme of death. The Society preserves tissue samples of every individual they deem worthy with the goal of one day bringing them back to life when the technology is perfected. But Cassia rebels at this. “The Society can’t do this for us. We can’t do this for ourselves. There is something special, irreplaceable, about the first time living.” I like that. Now I have to give my thoughts on the love triangle, just because it is the driving force in the series. Xander is Cassia’s perfect match. Her falling for Ky felt forced in book one. And even though I just spent an entire book with Ky, I still feel the same way. Their relationship just doesn’t have the grounds for this level of involvement and committment. So which man will win out in book three, heart or reason? Passion or familiar and comfortable? Either way, I’m guessing the other fella will get killed off. 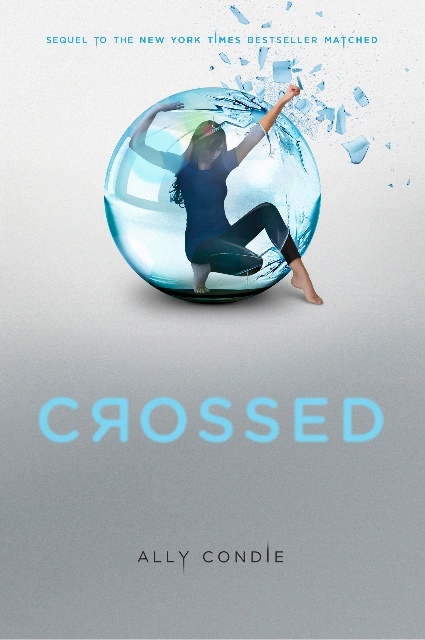 I appreciate that Crossed is cleanly written. There is no heavy physical intimacy or profanity, and the violence is pretty tame. I’d say it’s appropriate for younger fans of dystopian romance (10+). I’m not dying to get my hands on the last installment, but I probably will read it. You’re right; Erik; it’s YA. Very clean YA, but I don’t think you’d like it. The sappy moments even make me roll my eyes.